Great country-of-origin poster for the Norman Wisdom classic. Actual poster size 30 x 40 1/4 inches. (typically 30 x 40 inches). Light staining on white jacket from poster being stored folded, minor creasing on edges. 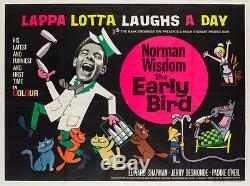 The item "Original The Early Bird UK Quad, Film/Movie Poster 1965" is in sale since Wednesday, November 16, 2016. This item is in the category "DVDs, Films & TV\Film Memorabilia\Posters\Originals - UK Quads\1970s". The seller is "orsonandwelles" and is located in Bath.